Hoping to return home after an unwise affair that ended with a bounty on his head, adventurer Ethan Gage teams up with grizzled Norwegian Magus Bloodhammer on a quest to find a legendary artifact that some believe possesses the power to control the weather; an endeavor for which he must locate a tribe of fair-haired Native Americans. 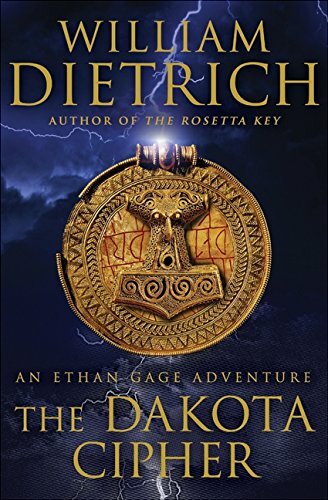 William Dietrich is back with another fast-paced new adventure—one that brings together Norse mythology, the American wilderness, and a swashbuckling explorer in an irresistible page-turner. Ethan Gage, the hero of Napoleon's Pyramids and The Rosetta Key, just wants to enjoy the fruits of victory after helping Napoleon win the Battle of Marengo and end an undeclared naval war with the United States. But a foolish tryst with Bonaparte's married sister and the improbable schemes of a grizzled Norwegian named Magnus Bloodhammer soon send Ethan on a new treasure hunt on America's frontier that will have him dodging scheming aristocrats and hostile Indians. In 1801 newly elected president Thomas Jefferson, taking office in the burgeoning capital of Washington, D.C., convinces Ethan and Magnus to go on a scouting expedition—one that precedes that of Lewis and Clark—to investigate reports of woolly mammoths and blue-eyed Indians. The pair have their own motive, however, which they neglect to share with the president: a search for the mythical hammer of the Norse god Thor, allegedly brought by fugitive Norsemen to the center of North America 150 years before Columbus. Can the hammer control thunder and lightning? Is there a core of truth to this myth? Ethan's journey takes him across the Great Lakes to country no white man has seen, but not before he becomes entangled with a British temptress, a comely captive, a French voyageur, and a landscape as breathtaking as it is perilous. Ancient Norse runes will lead him to his most fantastic discovery yet—and to wonder, danger, mystery, and sorrow that will test every ounce of wit and skill Gage can muster. The Dakota Cipher is another exciting adventure by a writer who has quickly become one of America's most beloved and inventive thriller masterminds.